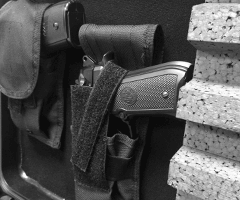 Universal Gun Holster Case holds an Ar rifle with space for magazines. Gun case lid features (1) handgun holster pouch, (1) magazine pouch, and (1) accessory storage pouch. Handgun holster is universal. Gun Case is lockable, and features four padlocks (locks not included).Case is airtight and watertight. Extra holsters can be added at checkout. 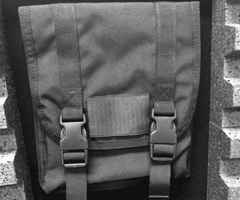 M16 12 pack Rifle case can hold M16 rifles, M4 Carbines or Remington 870 shotguns (with 14" and 18" barrels). The Five Pack Quick Draw Handgun Case transports multiple handguns with space for accessories. KR50 rifle case protects firearms with the length of up to 50 inches long. 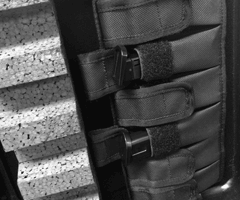 AR Rifle Case holds one Rifle with seven magazines and one handgun with three magazines. Weapon carrying case is universal and has interlocking convoluted foam. Case protects firearms up to 41" in length.